"All who wander are not lost." While gardening last summer I noticed an odd vine growing through the cedar hedge that provides some privacy on two sides of our yard. When pulled a little I discovered it was a piece of wisteria. Our former neighbours planted it along their fence, then later re-contoured their yard so it wasn't even visible from their home. I wrote about Pat and Wendy last September in a post featuring dahlias. Last week I noticed the wandering wisteria was ready to bloom, so I arranged it artfully (or not) on the newly stacked woodpile. You can see the blooms hanging in mid-air in the top photo. I like to think the wisteria came visiting, looking for a little appreciation for blooming so beautifully. Each time I go out to the garden I take a sniff of its heady sweetness. Thank you, Miss Wisteria, for coming through the hedge. Feel free to bring your friends and family along. There's room for more! Lovely! By next year your woodpile will no longer be visible under a cloud of Wisteria! That is so neat! What a nice discovery to enjoy for a long time to come. I love your art photo. What a lovely visitor and a nice surprise. We have an empty lot near us and in the early spring it is covered in a purple cloud of wisteria. I always make sure to get down there and take a whiff. I do love that scent. It really looks pretty against the wood pile! And what a pretty shade of lavender! Hugs! Such a pretty discovery...I love the delicate blooms. The wisteria would be a welcome visitor. It looks beautiful with the backdrop of the woodpile, the delicate shadows showing. Heady sweetness is a good word to describe it. There's just nothing quite like it! What fun to have that come visiting! Now that's a lovely visitor...I've never seen wisteria nor sniffed it. I'd open the gate wide for such a visitor! MMMM wisteria! A lovely visitor. Heavenly. On really hot days I often close the dining room window in the late afternoon as the scent can be too strong. Free plants and beautiful too. All welcome. Such a pretty visitor! Our wisteria will be much later in blooming - but it just extends the pleasure as we get to enjoy everyone else's first! Beautiful! If your wisteria is blooming, mine can't be far behind. Yay! Wisteria is so pretty and the Water Colored Piece is wonderful. Loved seeing these. Oh quelle bonne surprise ! Celle de notre voisine penche par dessus le grillage, chez nous aussi, et on est bien contents ! Somebody should enjoy those blooms and I'm glad it's you. There is always room for more flowers! 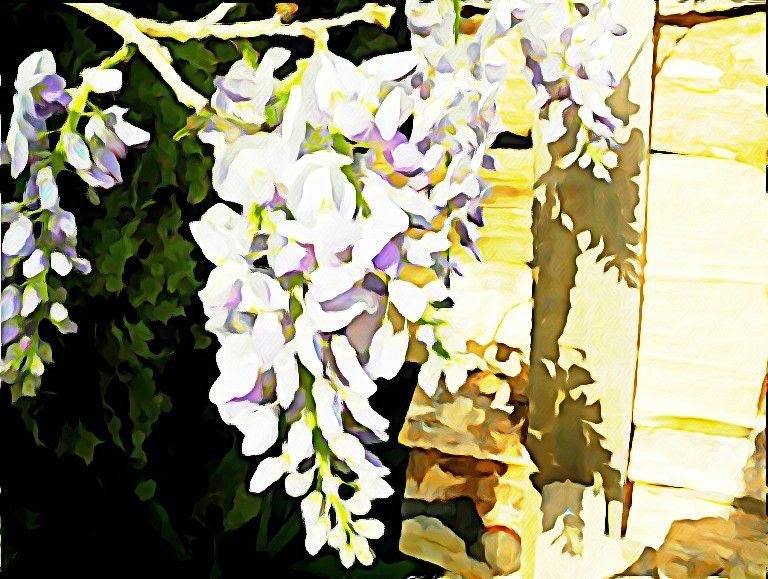 Your wandering wisteria is so very pretty, whether water coloured or photographed, and I'm sure, enjoyed the most, in person! Have a lovely weekend, Lorrie! What a lovely "gift" to appear! Adore the watercolor effect photo too. Today Katie and I saw beautiful wisteria at the Biltmore Estate in Asheville. quickly and ready to share next week.